BrewDog at it again. Ya gotta love ’em! Scottish brewer BrewDog has once again pushed the boundaries of good taste by launching a beer served through a taxidermy bar tap. 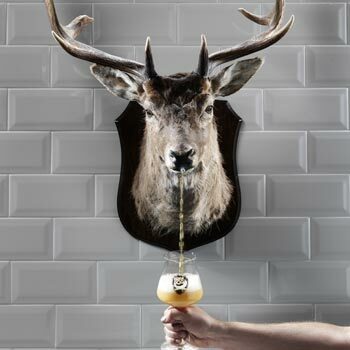 At 28% abv, Ghost Deer – served from a bespoke bar tap made from a real stag’s head – is the world’s strongest fermented beer. The independent brewery has aged the artisanal golden Belgian ale in six different oak casks and have released it in order to “smash UK perceptions of beer”. Ghost Deer will be available exclusively in the BrewDog Edinburgh bar for £9.99 per glass for one month only. Just 200 litres of the beer have been produced. BrewDog co-founder James Watt said: “Ghost deer is designed to fuse craft beer, art and taxidermy. “This is a revolution in brewing and in beer dispense. The impact is at once beautiful and disturbing – it disrupts conventions and breaks taboos, just like the beer it pours. “At 28% abv, Ghost Deer is the world’s strongest fermented beer ever. For those who might be a little put-off by the dead deer, it is worth pointing out that BrewDog has previous form in this respect. Last year the company launched The End of History – a 55% abv ale which was packaged inside roadkill. The brewer has also previously courted controversy with the release of Sink the Bismarck – a 41% abv beer released as part of its long-running battle with German brewer Schorschbrau to produce the world’s strongest beer.